Write Short -- the Mechanical Way! Recently, on the Magnum Steno Fan Club group over on CSR Nation, there was a discussion on the pros and cons of wide keys ... and someone mentioned a technique for making their own wide keys with some glue and a swizzle stick --! I mentioned (for some reason) that I heard somewhere that someone used credit card to shim their writer (and no, I don't mean they used the credit card to pay for the procedure, either ...)! Next thing you know, Kathryn A. "Stenoray" Thomas logged on, and wrote, "I did it, I did it ...!! ", and she described how she shimmed her writer, with a credit card. As you know, I'm always on the lookout for good cheap and sleazy tips and tricks for my readers ... so I immediately asked her if she would write those instructions for ol' Cheap and Sleazy, and include pictures. She agreed, and this article is the result. Also, in the interest of full disclosure, Kathryn is the source of the gleeful quote on discovering digitalCAT's new Suggest Briefs feature (see the 26AUG09 update if you missed it). You will probably notice that the squirrel I mentioned on the main page is NOT required for this mod to work! SHIMMING: Altering the stroke depth on your Stentura/Flash/etc. machine so it's shorter than the manufacturer could make it. 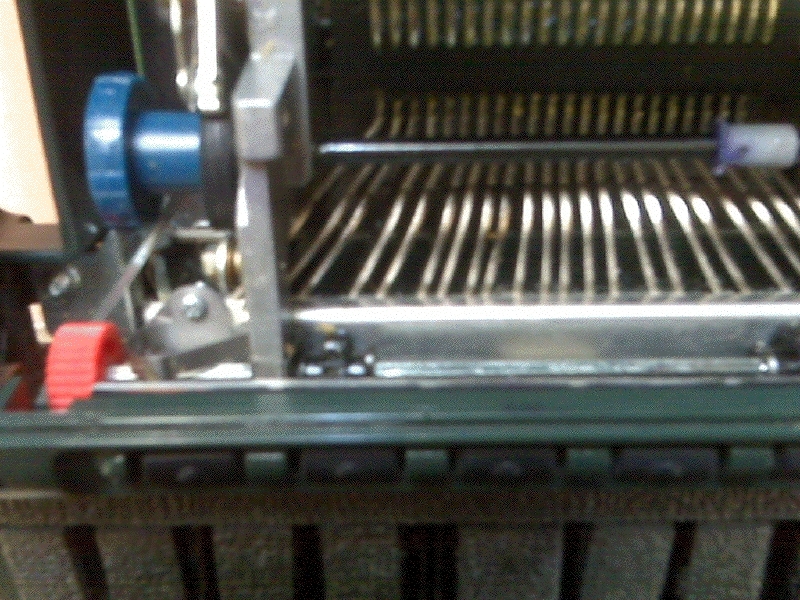 Steno machine repair services can do this for you, but you can do it yourself if you choose! I doubt this method will work on non-paper machines, but I haven't messed with any of them. I didn't come up with this idea. I was buzzing around the forums several years ago, and someone somewhere mentioned something in passing about hearing about someone possibly maybe shimming their Stentura with a credit card. I live on the edge and thrive on excitement and adventure, ("Danger" is my middle name*) especially if it involves tinkering with expensive equipment which would put me in deep doo-doo if I screw it up. But as I examined my Stentura, it occurred to me that this task wouldn't be that risky after all. NOTE: This does NOT lower your number bar. I liked the higher number bar, so no biggie for me. It may be a biggie for you. I haven't the faintest clue how to lower the number bar along with the rest of the keys. If you've found a solution that doesn't screw up anything, please share it. So you take a credit card. 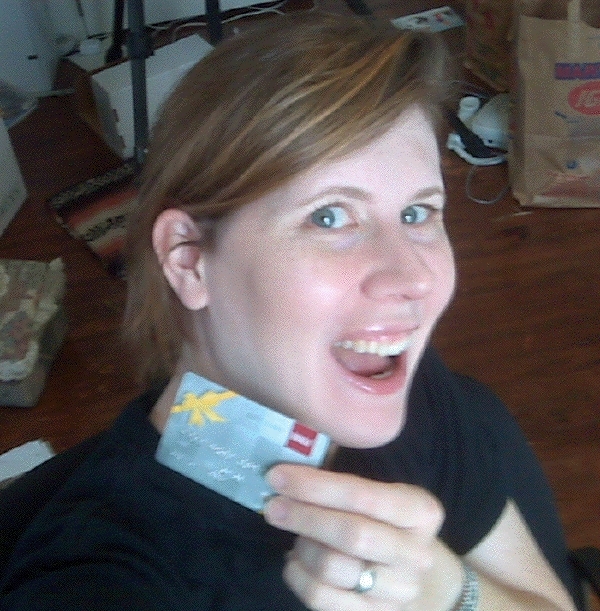 This is me with a sample card, taken in true one-outstretched-arm MySpace tradition (except I'm wearing a shirt, not a bikini; and we're in my office, not looking in the bathroom mirror). 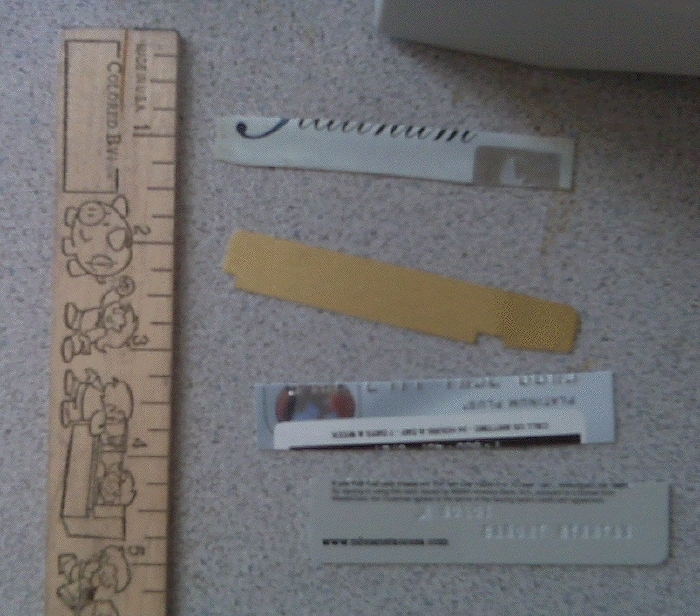 Cut the donor card into strips lengthwise, about a quarter- to a half-inch wide. I found I needed two strips to get the shallow stroke I wanted. You may only need one strip; it's up to you. If you're a two-stripper (insert your own joke here), stack the strips on top of each other and proceed to your machine. Pop the top and remove the ribbon. See the orangey-red dial? That turns two gears that press down on a silver bar, and that bar holds your keys down lower and lower. Turn it a little bit, and you can see what I'm talking about. Turn the dial until your stroke is as low as it can go. Now take your credit card strip or strips (glue them together if you want, but make sure the glue is COMPLETELY DRY before doing this step) and slide that puppy between the gears and the bar. You can press your right thumb down on the far right side of the bar and slide it in with your left hand. For added challenge, try taking a picture of this process at the same time! Make sure it's good and aligned, stick your ribbon back in, and off you go! 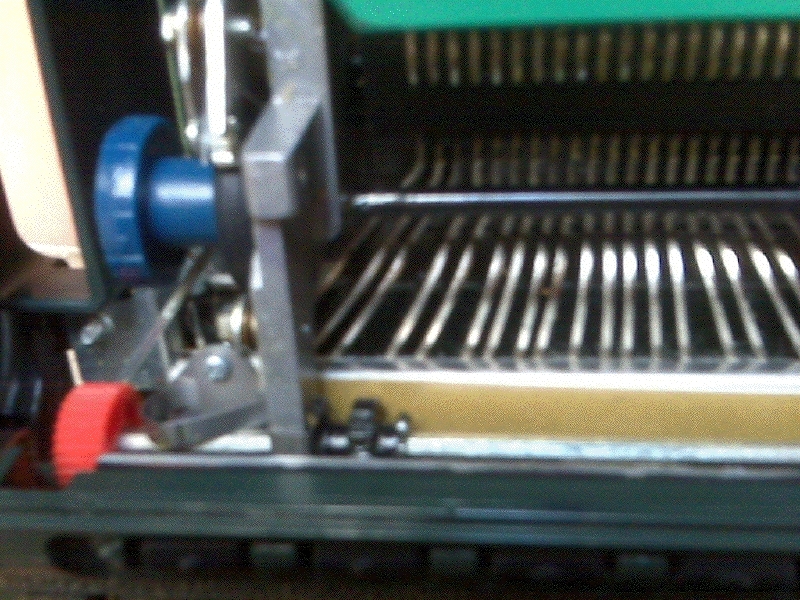 I had to adjust a key here and there, but other than that, the shim didn't hurt my machine a bit. 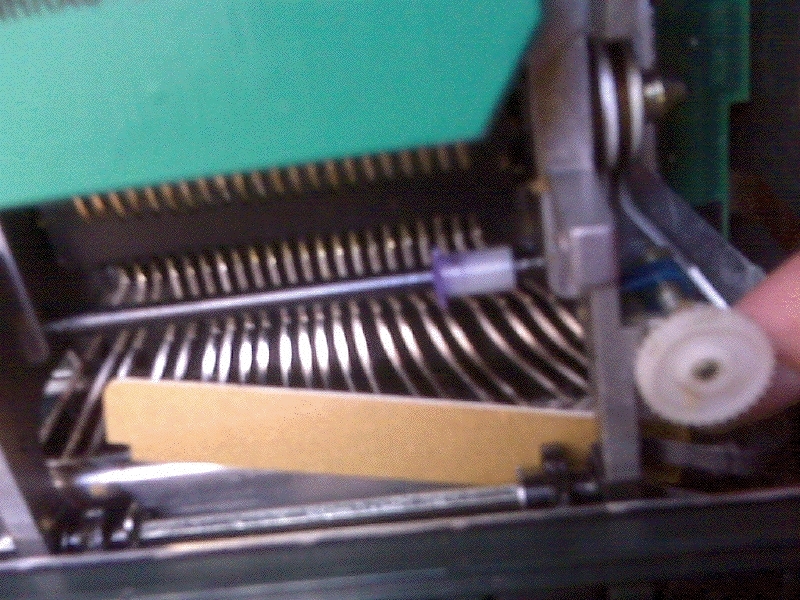 I had the shim in for several years (before I finally got the ultimate in shallow depth stroke, the LightSpeed), and it never slipped or slid or did any damage. And you can put it in and take it out anytime you want. So give it a whirl and see what you think. I hope this helps! *Actually, my middle name is Ann.